My house windows are old single pane windows, and they fog up when it's "cold" outside. This leads to annonyment and mold. I've been using a computer fan to dry them out. If I leave it on, the window doesn't fog, or at least, the water droplets evaporate off the window and it stays clear. Q. Is this just making *more* water vapour in my house, as water constantly condenses on the glass and fan air takes it away? In other words, does the layer of condensed water on the window help insulate it, so less water condenses on it? Yes I know, I need a dehumidifier! It won't add moisture, the condensation is just moisture in your inside air turning liquid when it hits a cold surface. As an alternative to a fan, you'll sacrifice your view, but this might help and it'll cut your heating bill in those long Canadian winters. Oh cool, I'll have to try that bubble wrap trick! Thanks Druid! Snaggy there are kits of heat shrink vinyl that staple to the outside window trim and you make it tight with a hair dryer. MoMan, yep I've seen and used those over the years, but never liked them. Back in Ontario they wouldn't last long before being shredded, but hmmm, maybe here where it's milder, they would. Perhaps I'll try one window with that, one with the bubble wrap. That may explain why I have seen them installed inside the house. 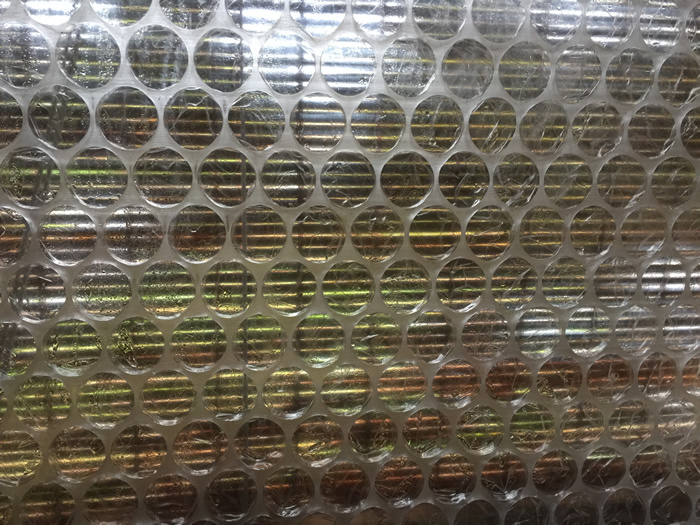 Window update: Huge difference with the bubble wrap, the room is warmer, and no condensation on the outside of bubble wrap. Next to the glass there is some water, especially where the wrap separated from the glass, but still magnitudes less than without bubble wrap. Still worried about mold though, I suspect it will be a bloom'in mess at some point. Keep me posted, I only saw that suggestion recently, and haven't got around to trying it m'self. We don't have a condensation problem, but there's a couple of spots in Casa del Druid that are uncomfortably close to slabs of cold glass in Winter. I'm wondering if a little windex on the glass before you apply the bubble wrap would act as a mold retardant. Just what you need "Retarded Mold"
I'm on a bubble roll. This time, testing two different bubble sizes. Snaggy a quick word of caution, flue gases from a furnace or space contain a lot of water vapor. Are you sure that your heating apparatus is venting correctly? The same question if using a gas water heater. I do recommend a Carbon Dioxide Detector for you and Nitros safety. So far, loving the bubble lifestyle! Thanks again Druid for that tip! I love this! It's made a huge difference in water coming down on my sills and the rooms feel warmer. There's a little bit of water on the sills, but nothing like it used to be, and the mould seems to be under control so far. Today it's cold and there's even snow outside, but moisture is under control! I do have to check it now and then to be sure the bubble wrap is against the window, and occasionally need to spray some areas every now and then so that the wrap sticks. Bigger bubble wrap seems to work a little better than the small stuff. Thanks so much for that link Druid! Snaggy if you should happen to have one of those in/out door thermometers, could you put the probe next to the glass and the inside unit tight against the bubble wrap. I am curious about the delta "T" that you are getting. Pretty much doubles the R value of the window. Snaggy - it's getting on for what we here in paradise laughingly call 'Winter' and I thought I might do the bubble wrap thing. Any updates on your comments above now that you've had a chance to see how it goes through an entire real Winter?